Your Texas Estate Plan: Government shutdown, Obamacare, now what? Government shutdown, Obamacare, now what? Maybe you, like "the markets" just don't care about a government shutdown. I am still at work, but I do have friends who are sitting at home and not working, not by choice, which means they are not getting paid. Here is a quick rundown of the what/why. ﻿﻿﻿﻿Congress is supposed to pass a budget so the government can pay for things, aka their "power of the purse". As a new fiscal year has started, there was no new budget, so there is no purse. Also, the first "Obamacare" healthcare exchanges are opening up, albeit with some glitches. House republicans (and Texas' own Ted Cruz in the senate) are using this stalemate/government shutdown rhetoric to continue to attempt and get the Affordable Care Act (AKA Obamacare) defunded, cut back, or delayed because they just don't like it. The Senate, with its Democrat majority, continues to offer a budget that contains implementation of Obamacare, while the Republican majority in the House continues to not approve the Senate proposals and offers in return a plan that defunds/delays Obamacare, but funds the government. Think ping pong, with Obamacare as the ball. 3. What does this mean, really? This shutdown means different things to different people. If you're a furloughed government worker, you don't really care as much about the healthcare squabble as you do about your job. As long as they fight, you sit at home idle, as does the mars rover and the pandacam. (Disclosure, I love the national zoo, and the pandacam). Obamacare is a trickier position. The general pro-obamacare argument can be summarized in this quote from the Washinton Post's Ezra Klein: "this is all about stopping a law that increases taxes on rich people and reduces subsidies to private insurers in Medicare in order to help low-income Americans buy health insurance. That's it. That's why the Republican Party might shut down the government and default on the debt." The conservative view, is generally that Obamacare is another handout to the poor, a tax on those who already work hard, that anything mandatory is an affront to personal liberty, and it will be another costly step into the ever growing welfare state where we now live. Universal healthcare seems to work in other countries. Can it work here? I don't know, but if yes, it will take a while to get it right. The grandstanding of the President and Congress that it if its good enough for America, it is good enough for them as well seems to be a sham, and even the new IRS agents that will be enforcing the law do not want it for their own plan. Seems fishy. Two very different approaches to the same story. Notice how shutdown changed to slimdown, on foxnews.com and things really are not that bad. 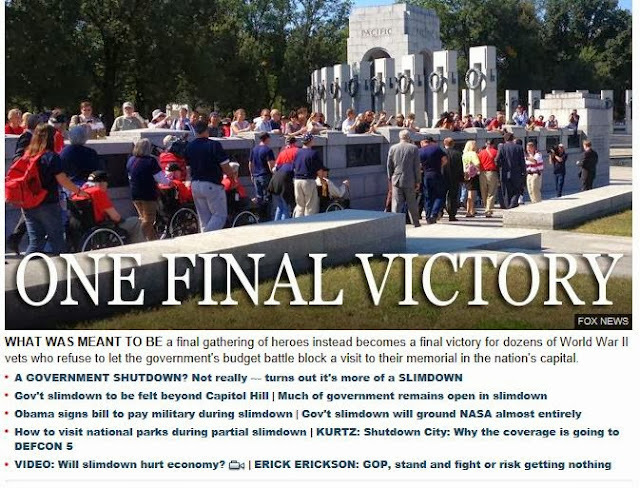 Here, we have heroes of WWII "storming" the monument after it was closed by big bad government on the day they were supposed to visit, with bagpipes as their war cry. Cnn.com mentions it too, but not as the lead story. The lead story is that there is a no deal, which is a big deal. Yes, the fight against Obamacare is the fight of the "rich" against the poor and uninsured or underinsured, sort of. But its also the fight against the middle against insurance companies who already took too much of their paycheck, and against the government for making the insured pay for the uninsured who abuse emergency rooms as if they were their private physicians, and for making a mandatory system that you pay a fine into even if you don't use. I am a relatively healthy person with insurance I pay for. My insurance costs are rising, substantially, under Obamacare. Thus, I don't really like the plan. However, I do know some people who are not healthy, tried to find private insurance, but due to pre-existing conditions, could not get any insurance at all. These are not the "poor" or the "morbidly obsese" or any other of the ridiculed "other" that get the blame for rising healthcare costs, they are just sick folks who got cancer, or ALS, or were born with whatever they suffer from. So, I can see why they would want Obamacare, and I can't argue that too much. Also, the government "shutdown" really is a "slimdown," as only "non-essential" workers go home or get furloughed. Mail still gets delivered, social security and medicare benefits still go through, planes can still take off and land, and our armed forces are still getting paid. So there's that, but I have friends sitting at home who have jobs they deem "essential," to their families. A slimdown is not a good thing either. The shutdown is bad. Congress is a mess, and it has been for a long time. The Affordable Care Act was passed over 3 years ago, yet Republicans are still not letting the biggest pieces of the President's legacy go without a fight that he will refuse to lose...seem like an impass? Is it perfect? No. Do I like it? No, but that is only because it just costs me more money: I'd love it if it helped me out. Do I have a better idea? No, and neither do the Republicans as of yet, which is why this fight can really do no good. Lets just give this a try, if it doesn't work, we can change it. This is America, that's what we do. Albeit slowly. The bigger issue is going to come in 16 days, when we have to place the Full Faith and Credit of the United States on the line again when we run up against our debt ceiling, which we have to raise again or run the risk of default. This is even a bigger deal than the shutdown. And the fight starts all over again.